Components of three different cake, filling and frosting recipes are combined for an ultimate fantasy birthday cake. 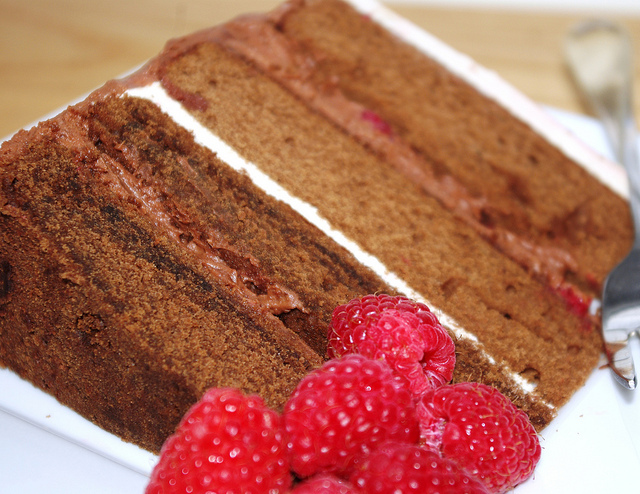 Tender layers of a classic chocolate butter cake alternate with a Latin-tinged chocolate cream, raspberries and caramel-flavored Brown Sugar Buttercream. Beranbaum recommends a slightly unusual technique, using the mixer to aerate dry ingredients before incorporating wet ingredients, instead of first creaming butter and sugar, then adding dry. It’s detailed, but not difficult. . .
just different. Give it a try for these light, ethereal cake layers that are full of chocolate flavor, but disappear like a whisper in the mouth. In a medium bowl whisk together cocoa and boiling water until smooth. Cool to room temperature. In a large mixing bowl combine the remaining dry ingredients and mix on low speed for 30 seconds to blend. Add the butter and remaining cocoa mixture. Mix on low speed until the dry ingredients are moistened. Increase to medium speed (high speed if using a hand mixer) and beat for 1 1/2 minutes to aerate and develop the cake’s structure. Scrape down the sides. Gradually add the egg mixture in 3 batches, beating for 20 seconds after each addition to incorporate the ingredients. Scrape down the sides. Scrape the batter into the prepared pans and smooth the surface with a spatula. The pans will be about half full. Bake 25 to 35 minutes or until a tester inserted near the center comes out clean and the cake springs back when pressed lightly in the center. Cakes should start to shrink from the sides of pans only after removal from oven. Let cakes cool in pans on racks for 10 minutes. Loosen sides and invert onto cooling racks. To prevent splitting reinvert so that tops are up. Cool completely before frosting. Beat the crema wtih the vanilla to soft peaks. Add sugar and continue beating until mixture starts to stiffen. Refrigerate until ready to assemble cake. Melt chocolate in microwave, being careful not to allow chocolate to boil. Fold 1/4 of crema mixture into chocolate, using spatula. Fold in reminder of crema mixed to thoroughly blend. Use immediately, as chocolate will start to harden. 1 pint fresh raspberries, cut in half. Split each cake layer in two, using a serrated knife. Brush off crumbs. Place first layer, top side down, on plate. Top with chocolate cream filling, arrange raspberries on filling. Place second layer over raspberries, bottom side down. Press down slightly. Spread buttercream frosting over second layer. Top with third layer. Repeat with chocolate cream and raspberries. Place final layers over chocolate cream, top side down. Frost sides of cake with chocolate cream and top with brown sugar buttercream.